Kids' Book Review: Review: Peter Rabbit: Hello Peter! Review: Peter Rabbit: Hello Peter! 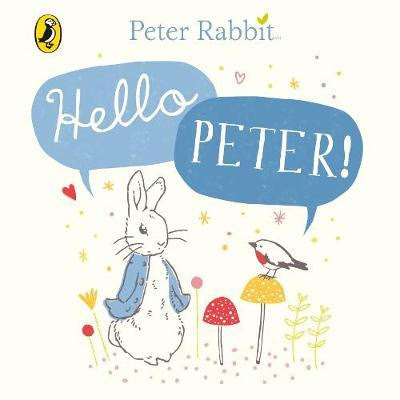 I just adore Peter Rabbit and Beatrix Potter and hence I love this little board book, Peter Rabbit: Hello Peter! This book is a great introduction for your little one to both the character of Peter and his creator Beatrix Potter. Peter Rabbit: Hello Peter! is a short playful rhyme book, only five double page spreads, that follows Peter Rabbit though his day of hopping, hiding, jumping, playing and cuddling with his mother before going to sleep. The illustrations are created with line work and soft, gentle pastel colours. The pictures include the occasional blocks of colour that highlight the iconic light baby blue of Peter's jacket and his mother's dress plus the rich terracotta pots and greenery from Mr. McGregor's garden. Traditionalists of Beatrix Potter will love how the contemporary feeling pictures in Peter Rabbit: Hello Peter! are true to Beatrix's style of watercolour illustrations. Once your littlie is older, you can share the original story, The Tale of Peter Rabbit. Title: Peter Rabbit: Hello Peter!